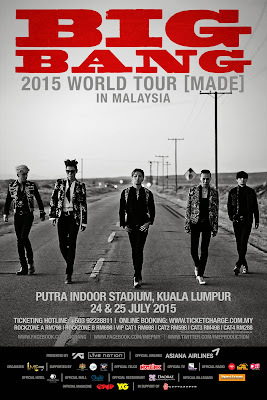 Kuala Lumpur, 21 May - BIGBANG 2015 WORLD TOUR [MADE] IN MALAYSIA ticket launch was successfully held on 17th May at Quill City Mall. Thousands of BIGBANG fans were present at the ticket launch to purchase the tickets last Sunday. The concert tickets on July 25th were sold out within few days after the ticket launch. Fans have been requesting for additional show as they did not manage to purchase their tickets. After further discussion with the Korean management, IME Productions decided to add an additional show on July 24th (Friday), 8:30p.m. at Bukit Jalil Putra Indoor Stadium. Another surprise that fans can look forward too is the concert's giant banner which will be hung at Quill City Mall's building this Saturday. Supported by Malaysia Major Events, a division of Malaysia Convention and Exhibition Bureau (MyCEB), an agency of the Ministry of Tourism and Culture together with Official Telco Hotlink. Online sales for July 24th concert will begin on 22nd May (Friday) from 10a.m. onwards via TicketCharge at www.ticketcharge.com.my. Rock Zone A ,B and VIP Cat 1 ticket holders are entitled for "Sound Check Party" lucky draw. For more information on the concert, visit IME Productions' official Facebook page or BIGBANG official Facebook.